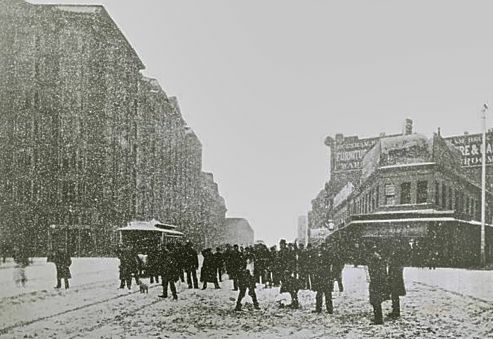 The locals panic as snow hits San Francisco in December 1882. "Those blue skies kissing the Bay Area with a chilly semblance of warmth Tuesday were just teasing, it turns out, because the cold - and we do mean cold - hard truth is that snow appears to be on its way to San Francisco," reports Kevin Fagan of The San Francisco Chronicle. "On Saturday morning, forecasters say, city folks could wake up to find their find their streets carpeted an inch deep in wet alabaster for the first time in 35 years. And it's expected to be even thicker elsewhere around the Bay Area, especially in the hills." These could be famous last words, but at 9pm on Friday it's clear and cold...hard to imagine snow or even rain. I drove a '73 Plymouth Fury II on the "streets of San Francisco" in the '80's (paid $50 for it). I had to stick my head out of the door window to see the oncoming traffic at the top of some hills because the hood was as long as a Chevette. It's a good thing the cable cars are chained to the street! This ex-Flintite lived on 23rd and Market just above Diamond St in San Francisco in the 60's and we had a snow storm and the kids on my block were using garbage can lids to use to slide down the snowy hill. Marv, I know that area well. Used to play tennis at the single court near 24th and Douglas, down the street from the Alvarado School.